A Brief on Policy and Practice to Inform National Strategies for Preventing Violent Extremism and Promoting Sustainable Peace. 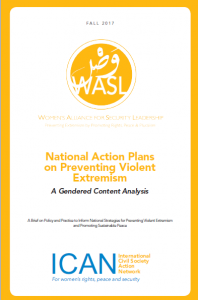 Due to the importance of National Action Plans as policy instruments in the prevention of and protection against violent extremism, and the ongoing work in this realm by national governments and civil society organizations, the International Civil Society Network (ICAN) sought to gain a better understanding of the content of the plans that have been published thus far in 2017, and to highlight good practices and gaps particularly in relation to the inclusion of civil society and gender perspectives and priorities. To this end, ICAN conducted a content analysis of nine NAPs, analyzing whether and how specific themes and target groups were discussed, including education, media, civil society, gender/ women, and human rights.